Cast iron French toast is the bomb. But there's a secret ingredient that takes it from good to great. In my younger, gluten-filled days, the best French toast came from (surprise!) French bread. If you have the intestinal means, I would strongly recommend sticking with that program. For gluten free French toast, there are several hundred terrible options, and a few good ones. I recommend going with Udi's gluten free whole grain sandwich bread. Here's that secret ingredient: Sherry (the liquor, not the girl). 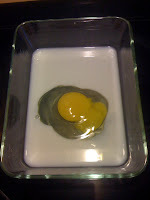 Mix the milk, egg, sherry, and spices/salt together, making sure the eggs are beaten well. Always start with a shiny (well-oiled) cast iron skillet. Heat a large cast iron skillet (or griddle) on medium-low heat until hot (a drop of water should dance on the surface and evaporate within 2 seconds). This will probably take 8-10 minutes. Be patient. If you're OK with gluten, the best choice by far is French bread sliced into 1 1/2 inch thick slices. If you're going gluten free, Udi's sandwich bread is an outstanding choice. Either way, dredge your bread though the liquid, turning it over a few times to ensure even coverage and some good interior soaking. No one likes dry French bread... so err on the side of a longer soak and more wetness—especially with thicker bread. Add a pat or two of butter to your hot cast iron skillet, and swish it around for even coverage. 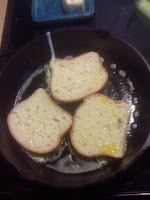 Lay your dredged bread slices into the hot skillet. Cook for 1-2 minutes (until browned on the bottom) and then flip the bread slices over. Cook for another 2-3 minutes (again, until nicely browned). If you think the inside is too moist, you can cook the slices for another 30 seconds to a minute on each side. If you're keeping the French bread in a warming oven before serving, consider reducing the cooking time. 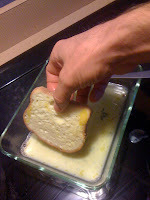 Re-butter the skillet each time you add fresh bread slices. If your pan is too hot and the bread seems to be burning before the insides are done, remove the French bread from the pan, and remove the pan from the heat. Once things have cooled down, get the pan back on the heat and the French bread back in the pan... and continue. Serve as soon as possible with a large pat of butter and warm maple syrup. Finally bought dry sherry and tried this, and it was really good. I added 2 tsp sugar (bad habit) and subbed one tsp cinnamon for the spices (sometimes i mix up my own version of pumpkin pie spice without cloves, not a big fan) to keep it simple, and there really was something sublime about it. I'm sure it was the sherry as I make French toast every week, and instead of a half tsp of vanilla extract i added 1 Tbls sherry. Thanks for posting this, the sherry definitely adds a layer of complexity in a good way. Thanks for your comment. I'm glad you found the sherry sublime! I think I'll try your "bad habit" of adding sugar just to see what I might be missing. I've been using the Best Recipe cookbook's version of french toast for the past year (2 eggs, .75c milk, 1t vanilla, 2T sugar) and realized that simply adding sherry would change it into a sabayon type of french toast. Then I did a search thinking it would be all over the place, and found your recipe here -- brilliant, best french toast on the planet. Funny it doesn't seem to be out there on too many sites. Glad you like the sherry addition. I tried adding sugar when I made French toast last week, and I must say I am a fan! I'm glad you liked the sugar addition. I always make this now and really love it. I have posted my complete recipe to http://jungleofconcrete.blogspot.com/2011/03/my-favorite-french-toast.html, and have linked back to this page to give you credit for the sherry addition. Hope that's okay. Absolutely. Thanks for the link, and for sharing!